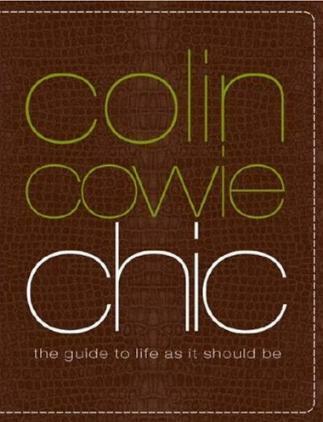 Colin Cowie is known for his impeccable taste when it comes to decorating and throwing parties and weddings. He's also known for his style and elegance. It would therefore seem quite natural that he would like to see us all living in style and with character. He does emphasize that you don't have to be rich to be stylish and that we all deserve to live our best lives. He covers Grace, Flair, Poise (personal style); A Gracious Home - Public and Private Spaces; Guests; Entertaining; Work Ethic; Traveling in Style, and The Office. He says, "The most important goal of decorating is to feel comforable in your own home. It's your personal space, not a stage set." So, even though his home is elaborate and precise, it doesn't mean yours has to be. Be comfortable. And chic. I agree with Colin that if your home is in order, then your life will be in order (or at least stand a better chance of being in order). However, I defy anyone with a family to maintain such order. For me, organized is having stuff in its place, not too much clutter, and keeping everything clean. For Colin, this is not enough. He gives us hints and tips on how to stock your kitchen (to be ready at a moment's notice); how to make the most of your bedroom, closet, and bathroom, and still be chic; how to make overnight guests comfortable; how to conduct yourself at work, and so much more. I think he covers just about everything. I've always loved Colin's table settings - my favorites this time around are #2 and #3 on page 190. Conclusion - Very useful. I wish more people would acquire "chicness."